Golmaal Again (transl. Hotchpotch again) is a 2017 Hindi supernatural comedy film, directed and co-produced by Rohit Shetty, and written by Sajid-Farhad and Yunus Sajawal. The film stars Ajay Devgn, Arshad Warsi, Tusshar Kapoor, Kunal Khemu, Shreyas Talpade, Parineeti Chopra, Tabu, Johnny Lever, Prakash Raj and Neil Nitin Mukesh in the lead roles while Mukesh Tiwari, Sanjay Mishra, Vrajesh Hirjee, Murali Sharma, Vijay Patkar, Uday Tikekar, Sachin Khedekar, Ashwini Kalsekar are featured in supporting roles and Nana Patekar makes a special appearance as himself. Golmaal Again is the fourth installment of the Golmaal film franchise. The film marks Devgn's tenth film collaboration with Rohit Shetty. The production of the film began in July 2016 and principal photography commenced in March 2017 in Mumbai. The film released on 20 October 2017. The film broke several records upon its release. With a box office gross of over ₹3.11 billion, it was the fifth highest-grossing Bollywood film of 2017 and one of the highest-grossing Indian films of all time. It received mixed reviews from critics upon release. The story starts with Anna Matthew (Tabu) (Ena in pronunciation) explaining that she can see ghosts and spiritual spirits due to a special power given to her by God and believes she has been chosen to help ghosts and fulfill their last wishes so that their spirits can achieve salvation. The story continues with Anna narrating one such incident of her life. The story revolves around Gopal (Ajay Devgn), Madhav (Arshad Warsi), Lucky (Tusshar Kapoor), Laxman 1 (Shreyas Talpade) and Laxman 2 (Kunal Khemu), who are orphans living in an orphanage located in the picturesque Ooty, managed by the kind businessman Jamnadas (Uday Tikekar). One night, Gopal, Madhav, Lucky and the two Laxmans find a baby girl at the gate of the orphanage. They name her Khushi and take care of her. The five boys also know Anna, who works in a library nearby. The boys are aware of Anna's power to see spirits from the other world. One day, Madhav pranks and scares the easily frightened Gopal in an empty bungalow, which leads to a fight between the two then young boys. Gopal gets punished and the five boys decide to leave the orphanage. Khushi is extremely upset with this as she is left behind. Khushi later gets adopted by a loving colonel and his wife. Years later, Gopal and Laxman 1 are estranged from Madhav, Laxman 2 and Lucky. The five, however, are once again reunited when the news of Jamnadas's death comes and they are invited to an event to be held to honour him. They return to the orphanage after 25 years, finding that nothing much has changed. The five enter the old bungalow where Madhav had scared Gopal. There, they meet the colonel; they are also reunited with Anna Matthew, and Pappi (Johnny Lever), another orphan from the orphanage. They also meet with Damini (Parineeti Chopra) whom Anna introduces as the bunglow's caretaker. Anna reacts strangely when she sees the boys acknowledging Damini's presence. At the special event for Jamnadas, businessman Vasu Reddy (Prakash Raj) reveals that the orphanage's kids will be shifted somewhere else, while the orphanage in Ooty will be demolished. Soon, one by one, the boys get possessed by a ghost that talks in Nana Patekar's voice. This scares Gopal, so Anna suggests they stay in Colonel's house. Madhav, Laxman 2 and Lucky are also staying in the Colonel's house, as they are handed over the job of getting Gopal and Laxman 1 out of the house by Vasooli (Mukesh Tiwari) and Vasu Reddy. The five of them fight daily, exasperating Anna. The boys finally make amends after Lucky gets possessed. They push Gopal, who has fallen for Damini, to express his love to her. Just then, Pappi tells that the girl who they thought was Damini is actually dead and the real Damini is alive and is Pappi's girlfriend. Terrified, they try to flee but Anna stops them and reveals that the ghost is of none other than their own Khushi, their childhood friend. Khushi then tells her tale that how she had met a young businessman, Nikhil (Neil Nitin Mukesh), and fell in love with him. Their marriage was fixed. One night, however, she witnesses Nikhil killing Jamnadas as Jamnadas confronted Nikhil about the latter's conspiracy of obtaining the orphanage in his name on the pretext of benefiting the orphans, and instead, demolishing the orphanage and building a construction site for his personal gain. Khushi then confronted Nikhil and threatens to go to the police and calls him a murderer. Nikhil then strangled Khushi to death. With Vasu Reddy's help, Nikhil proved Jamnadas and Khushi's death as accidents. Khushi came to Anna as a spirit, asking for help. Anna was surprised that the boys could see Khushi and took it as God's sign, which is why she brought the boys to the house to help her. The boys plan to scare Vasu into confessing the truth but their plan is ruined when Nikhil returns and mocks that they don't have any evidence to prosecute him for the alleged crime. This infuriates Khushi, who brutally attacks Nikhil and almost kills him. Anna calms her down and Vasu Reddy convinces Nikhil to confess. In the end, the orphanage is saved and Khushi's spirit, now content, departs happily to heaven after bidding goodbye to the boys. During the credits, the five dance with Khushi. In July 2016, Ajay Devgn and Rohit Shetty announced Golmaal 4, the fourth instalment of Golmaal marking the completion of ten years of the first Golmaal (2006). Among the previous cast of the Golmaal series, actors Ajay Devgn, Arshad Warsi, Shreyas Talpade, Tusshar Kapoor and Kunal Khemu were included in this installment. However, Kareena Kapoor was replaced by Parineeti Chopra in November 2016 after the former declined the part owing to her pregnancy. In late January 2017, Tabu was signed in for a crucial role. In February 2017, Neil Nitin Mukesh and Prakash Raj were signed for the film. Principal photography commenced on 9 March 2017 in Mumbai at Yash Raj Studios. The Mumbai schedule was wrapped on 2 April 2017. On 18 October, the theme song "Itna Sannata Kyu Hai" was released. The film received mixed reviews from critics. Meena Iyer of The Times of India gave the film 3.5 stars and stated that the film is full of laughs with no substance. 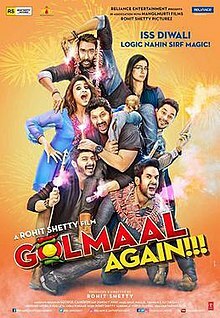 Raja Sen of NDTV gave the film 2 stars, stating that Golmaal Again is "a marginally better film than Golmaal 3 or Golmaal Returns" but felt the film was too long. On its opening day, Golmaal Again grossed ₹30.10 crore net, one of the highest openings for a Bollywood film in 2017. The film collected ₹28.25 on the second day. The third day's collection was ₹28.5 crore. On the fourth day, the film collected ₹15.25 crore, taking the total collections to ₹102.85 crore. On the fifth day, the film collected ₹13.25 crore. The sixth day's collection of the film was ₹10.5 crore. By the end of the first week, the film grossed ₹135 crore. The third week's gross was ₹197.4 crore. Golmaal Again grossed ₹200 crore after four weeks of its release in Indian box office. The film grossed US$3 million in its first weekend in overseas. The film grossed $160,000 in Nepal, and $400,000 in Pakistan in the first weekend. The worldwide collection of the film was ₹300 crore in its fourth week. Also it is the highest-grossing Indian film in Fiji. The film became the highest-grossing Bollywood film of 2017. Golmaal Again ran in cinemas for more than 50 days in India. The music of the film have been composed by Amaal Mallik, S. Thaman, Lijo George-DJ Chetas and Abhishek Arora while the lyrics of the film have been penned by Kumaar. The first track of the film titled as "Golmaal (Title Track)" sung by Brijesh Shandilya and Aditi Singh Sharma was released on 23 September 2017. The second track of the film "Neend Churai Meri" from the 1997 film Ishq has been recreated to "Maine Tujhko Dekha" for this film in the voices of Neeraj Shridhar and Sukriti Kakar and was released on 29 September 2017. The soundtrack was released on 6 October 2017 by T-Series. All lyrics written by Kumaar. 20 October 2017 was announced as release date of the film, coinciding with Diwali. ^ a b c Rohit Bhatnagar (14 July 2016). "Rohit, Ajay's Golmaal 4 set to release on Diwali 2017". Deccan Chronicle. Retrieved 9 March 2017. ^ "Golmaal Again Enters The List Of Most Profitable Films Of 2017". 31 October 2017. Retrieved 15 September 2018. ^ "Golmaal Again - Movie". Box Office India. Retrieved 17 April 2018. ^ "'Golmaal Again': Interesting facts about the film - TOI Mobile | The Times of India Mobile Site". m.timesofindia.com. Retrieved 2017-10-06. ^ "Golmaal Again - Movie - Box Office India". boxofficeindia.com. Retrieved 15 September 2018. ^ "Itna Sannata Kyun Hai Full Song". YouTube. Retrieved May 26, 2018. ^ "Confirmed! Parineeti Chopra replaces Kareena Kapoor Khan in 'Golmaal 4'". DNA India. 14 November 2016. Retrieved 9 March 2017. ^ A. Kameshwari (13 November 2016). "Ajay Devgn welcomes Parineeti Chopra to Golmaal's 'crazy family'". The Indian Express. Retrieved 9 March 2017. ^ "Golmaal Again: Tabu joins Ajay Devgn's comedy film". The Indian Express. 31 January 2017. Retrieved 9 March 2017. ^ "Golmaal Again: Neil Nitin Mukesh joins Ajay Devgn and gang!". The Indian Express. 3 February 2017. Retrieved 9 March 2017. ^ "Golmaal Again: Prakash Raj is the newest addition to Ajay Devgn-Rohit Shetty's comedy franchise". The Indian Express. 17 February 2017. Retrieved 9 March 2017. ^ "Ajay Devgn gives a sneak peek at the 'Golmaal Again' family". The Times of India. 14 March 2017. Retrieved 30 September 2017. ^ "Golmaal Again goes on floors today, sans Ajay Devgn!". DNA India. 9 March 2017. Retrieved 9 March 2017. ^ "'Golmaal Again' first schedule in Mumbai wrapped". The Times of India. 3 April 2017. Retrieved 12 April 2017. ^ a b "'Golmaal Again' box-office collection week 3: Rohit Shetty's directorial inches a notch closer to Rs. 200 crore club - Times of India ►". Retrieved 15 September 2018. ^ "Golmaal Again Box Office Collection Day 2: Ajay Devgn's Film Is 'Unstoppable'". Retrieved 15 September 2018. ^ "Golmaal Again Movie Review: Ajay Devgn Almost Makes This Film Watchable". ^ "'Golmaal Again' box-office collection Day 1: Rohit Shetty's film opens to a whopping Rs. 30.10 crore - Times of India ►". Retrieved 15 September 2018. ^ "'Golmaal Again' box-office collection Day 2: Ajay Devgn-Parineeti Chopra's film stands strong with Rs 28.25 crore on Saturday - Times of India ►". Retrieved 15 September 2018. ^ "'Golmaal Again' box-office collection Day 3: Rohit Shetty's comic caper rakes in Rs 28.5 crore on Sunday - Times of India ►". Retrieved 15 September 2018. ^ "'Golmaal Again' box-office collection Day 4: Ajay Devgn-Parineeti Chopra starrer zooms past Rs 100 crore - Times of India ►". Retrieved 15 September 2018. ^ "'Golmaal Again' box-office collection Day 5: Rohit Shetty's multi-starrer earns Rs 13.25 crore - Times of India ►". Retrieved 15 September 2018. ^ "'Golmaal Again' box-office collection Day 6: Ajay Devgn-Parineeti Chopra starrer earns Rs 10.50 crore - Times of India ►". Retrieved 15 September 2018. ^ "'Golmaal Again' box-office collection week 1: Ajay Devgn-Parineeti Chopra starrer rakes in Rs 135 crore - Times of India ►". Retrieved 15 September 2018. ^ "Golmaal Again Has Huge First Week - Box Office India". www.boxofficeindia.com. Retrieved 15 September 2018. ^ "Golmaal Again V Secret Superstar Overseas Comparison - Box Office India". www.boxofficeindia.com. Retrieved 15 September 2018. ^ Hooli, Shekhar H. "OMG! Golmaal Again topples Baahubali 2 collection to become highest grossing Indian film in Fiji". Retrieved 15 September 2018. ^ "Watch Golmaal Again song Hum Nahi Sudhrenge: Ajay Devgn and gang give us a feel-good number". The Indian Express. 2017-10-06. Retrieved 2017-10-06.